During my visit to the island of Newfoundland in late summer 2011, remnants of two hurricanes struck, and a third came ashore just after I left. Newfoundlanders shrugged. The Cape Ray area near Port aux Basques often has winds in excess of 190 kilometers per hour, equivalent to category 3 hurricanes. Those winds used to blow the sarcastically named Newfie Bullet off its narrow-gauge tracks before it was permanently blown off by construction of the cross-island highway and freight-hauling trucks. Nowadays, strong winds are mostly a bother to boats and laundry. 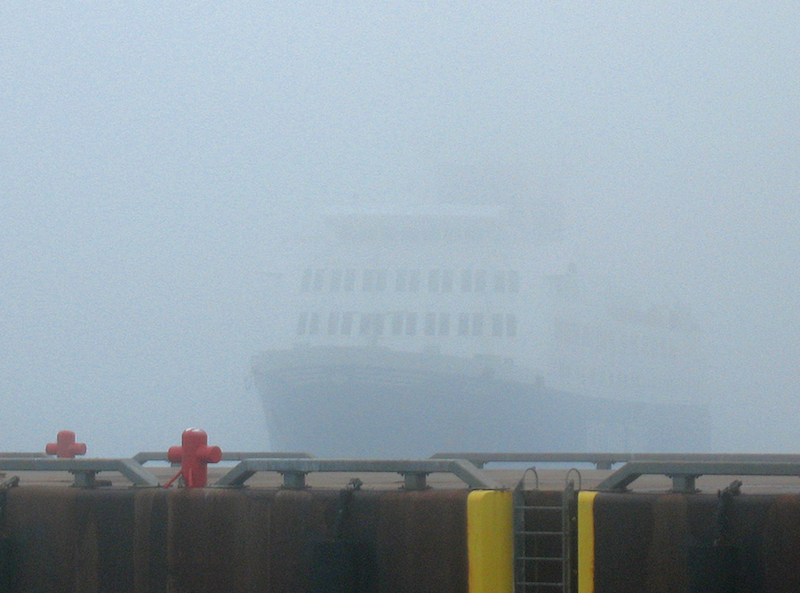 Boatmen stay ashore, except for crews on the large ferries to and from Nova Scotia and Labrador. Those vessels are part of the commercial highway and must set against the wind – and sometimes it seems, against reason. Winds were strong along the Strait of Belle Isle during the latter part of my detour to southern Labrador. A few days before I departed, the Labrador ferry, Apollo, had set out from St. Barbe, Newfoundland, for its two-hour crossing to Blanc Sablon, a small town in Quebec about two kilometers from the Labrador border. Aboard the Apollo were some high-ranking government officials, but the winds were too strong to dock on the Quebec/Labrador side of the strait. So the ferry loitered offshore, waiting for the gale to ebb. But the wind wouldn’t cooperate, and the vessel eventually had to return to Newfoundland, a wasted six hours of official lives. A big part of the docking problem at Blanc Sablon is that the Apollo has to back in. The ferry always noses in to St. Barbe on the Newfoundland side, so cars and trucks heading to Labrador drive on through the bow. The Apollo backs into the dock at Blanc Sablon and the vehicles drive off through the stern. Backing in is a much more difficult maneuver than nosing in, and requires more power. Wind just makes it worse. The failed crossing with the high government officials was prominently noted by the region’s weekly newspaper, the Northern Pen (and the inspiration for the newspaper in Annie Proulx’s novel, Shipping News). The Pen reported the Apollo was in need of repair and had been operating all summer at only 65 percent of its power capacity. During my own later crossing from Labrador to Newfoundland, I was told by a crew member that the vessel had to shut down the kitchen, as well as all other non-essential power uses, to gather enough thrust to perform the backing-in maneuver. It is possible the journey of those high government officials was thwarted by an overlooked toaster. My plans were to leave Labrador on a Monday, but I had become so enamored of the little outport of Red Bay that I decided to stay two more days. It is well I did, because the Monday crossing I had originally reserved was cancelled. Not just the crossing was cancelled, but most of the day for those with reservations, due to the particulars of the ferry operation. Had I tried to depart Monday, I would have left Red Bay about 10 in the morning to arrive at the terminal in Blanc Sablon by noon. The ferry was scheduled to leave at 1 p.m., and those with reservations have to check in at least an hour before departure. Arriving late not only forfeits the reservation, but incurs a $10 penalty euphemistically called a non-refundable deposit. On that Monday, the winds again were too strong for docking, and the Apollo meandered to and fro just offshore before finally giving up about 5 p.m. and returning to Newfoundland. During that time, those who were booked for the 1 p.m. crossing had to sit there and wait until the decision to abort was made. I would have wasted a day that could have been – and actually was – happily spent in Red Bay. So instead I left Red Bay for Blanc Sablon on Wednesday morning. The wind was mild and the forecast good. But by the time I got to the ferry terminal, the bluster had picked up again. Way up. The Apollo had not yet docked, and could not be seen, as the strait was clotted with a fog as thick as pease pudding. I checked in at the terminal office, where no one knew what was going to happen. I was assured the Apollo was just offshore, out there in the pease pudding. I prepared myself for a lost day, splitting time between reading a book in the pickup, and standing in the bluster on the edge of the wharf, looking for some sign of the ferry, some attempt by it to get close enough for us to cast our hope to one another. And then, after an interminable and dismal wait, the Apollo slowly appeared out of the fog, an apparition in transit from phantom to matter, gathering detail real and imagined. At first it was the ghost ship of the Flying Dutchman, then a three-master 150 years late from a whaling voyage, and penultimately a World War II merchant vessel come in from its dance with a German submarine. The Apollo was all of these, beyond its allotted time, unable to dock, condemned to wander in sight of land as the wind and the captain stared each other down. The afternoon wore on, and the wind actually strengthened, diminishing hope. But the captain did not blink. Instead, after two hours of posturing, he attempted to back in, despite what seemed a greater danger. Maybe it was the aftertaste of the failed crossing with the officials, or the subsequent bad press. Maybe it was a call from the owner, or a look from the first mate. Whatever it was, he did not blink. Heaving mightily against the wind, the captain swung Apollo’s stern to the Blanc Sablon dock. As soon as we were free of the Blanc Sablon harbour, the Apollo began to lurch from side to side. We were exactly perpendicular to the wind and its battering waves. At first, it was just my tea cup accelerating across the table. But soon the vessel began to roll violently. Some people, having spent years of their lives on boats, thought they could walk, but instead could only slam into bulkheads. Dishes and pots in the kitchen slid along counters and crashed to the deck. Doors banged open and shut. I threw life-preservers to the fears that kept bobbing up in my mind of ships lost at sea. As we got closer to Newfoundland, the wind hardly let up, but a bit of sun made its way through the fog, and little rainbows sailed above the waves reeling off Apollo’s bow. “That was one of our roughest rides,” a crewmember said as we approached St. Barbe. But the young woman sitting at the next table disagreed. But rather than being a comfort, her words were a disappointment. I wanted it to be one of the worst rides ever. I had paid dearly for those fears, and she had reduced them to mere paranoia.